Mr Nutcase is a brand that I was introduced to by my sister who reviewed one of their iPhone cases on her blog (here) and it looked great. My parents very kindly bought me an iPhone 5c (32gb) for christmas and I have been looking everywhere for cases - there are so many to choose from. So when I came across a blogger opportunity involving Mr Nutcase on Twitter I jumped at the chance and I was able to design my own iPhone 5C case! Mr Nutcase has a wide range of cases for so many devices! You can pick designs that their artists have made already or you can make one yourself with photographs you have of family, friends or summer holidays for example. You can choose to use one image or a collage. I chose the *Mr Nutcase Ultra Light Weight iPhone 5C Case (£14.95) with the half and half collage. I found royalty free images on google to use for my case although it was so difficult deciding which images to use! I picked a simple white and black striped image which I placed on the top half of the design and then a gorgeous ombre watercolour pink image for the bottom half. I love the combination! The case seems durable but lightweight and it is very easy to attached and detach from my iPhone 5C. The images printed onto the case came out so well, even though the images were not the best quality! However, the edges of the case were only half printed, so there is an edge where the printed images stops and the plastic case is. I wish it was printed as a wrap around case but as my iPhone has a white back anyway it isn't very noticeable that the sides of the case are mostly see-through. Overall, I love the final product, the design came out so well and it feels durable. It doesn't scratch or damage my iPhone when I attach and detach the case. The case doesn't obstruct the essential buttons/ports or the camera which is great. Mr Nutcase have a wide range of options for phone cases and tablet cases, so there is something for everyone and I think personalised phone cases would make great gifts! Have you bought a phone or tablet case from Mr Nutcase? What do you think of my design? This is such a cool idea, I love the black and white one you designed too! Such a clever idea! I need a case when I get a new phone so I'll have to check this out. I think one thing that would worry me a bit is that you can slightly see the black apple logo through your case - what would happen if you had one of the more brightly coloured 5Cs? Other than that, I think this is a really chic design and I love the fact that you get to have your own unique case! You pone case is so pretty. And that stars and moons case is so cute! This looks so pretty and I just love your design. I'm needing a new case too and I just love the idea of creating my own case. 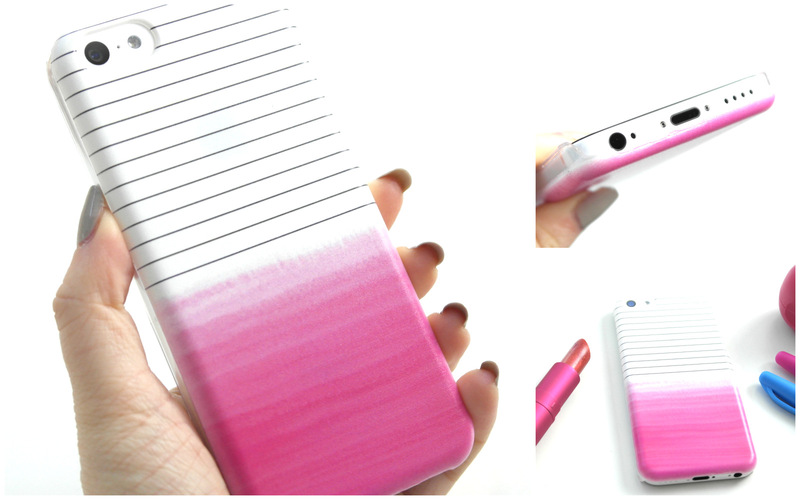 This case design is gorgeous, I love it, it goes so nicely with the white phone. Definitely need to check the site out, I really fancy a new case for my iPhone! Oh my gosh, the design is gorgeous! I absolutely love the design of this case, it's so pretty! Love this half and a half design!! Very cute! This is such an excellent idea!!! Love this case! So simple but pretty.